Just like aluminum cans appeared years before the invention of the can opener, so did the bottle sealed with cork appear long before the means to open them. Corkscrews weren’t always used exclusively for wine. The cork and the ability to mass-produce strong glass bottles appeared at about the same time in the early 17th century and was used as the standard package for beer, perfume, ointments, ink, medicines and cleaners. All of these products required the use of a corkscrew to open. Screw caps, pop-tops and bottle caps were all invented much later, well after World War I! Reference was made to corkscrews in 17th century literature, but nobody knows when one first appeared. 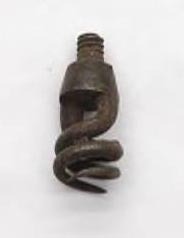 It probably was extremely similar to the standard picnic corkscrews used today; simply a steel screw with a handle, shaped like the letter T. The design was based on a “gun worm” used for cleaning stuck bullets from the barrel of guns. It was probably a gun owner’s trial and error that found this use for a spiral screw, probably for his beer! 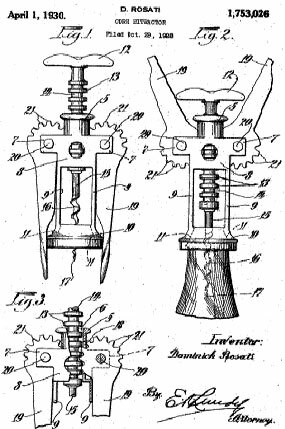 Buttons, coated worms, ratchets, springs, prongs, levers and fancy designs have been patented worldwide and have given rise to the hobby of corkscrew collecting. Online auctions have brought as much as $3500 for a single historic corkscrew. The highest bid ever was over $36,000 at a Christie’s of London annual Corkscrew Auction. A ’corkscrew museum’ has been created on the Internet (www.bullworks.net/virtual.htm) and Corkscrew collectors (called “Helixophiles” have formed associations and clubs worldwide. Although corkscrews come in dozens of styles and hundreds of brands, our favorite at Salut! 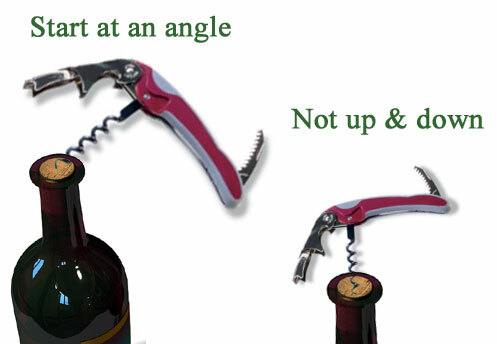 Wine Co. is the “Rialto” articulated corkscrew. It’s design is compact and effective in pulling corks with the least effort and without splitting the cork. You can purchase a Rialto online at www.salutwineoutlet.com. The trick to using this easy tool is to start with the screw at an angle…so the tip of the wire screw appears to be growing straight up from the center of the cork. Start all corkscrews this way. After one full turn the screw will “right” itself and proceed straight down into the cork every time if you let it. Visit www.corkscrewnet.com for a comprehensive collection of links and reference pages if you would like to know more about these complex inventions.